36L hopper, 12V motor with vinyl coating mounts to front or rear luggage rack, lever and gauge mounts to either side. Fits most brands of ATVs and comes with wiring harness for easy installation. Suitable for fertilizer and grass seed. All-steel frame features a quick detach for easy installation, and is powder coated to resist corrosion. Ideal for Farming, Hunting, Landscaping or Grounds Maintenance! 12V battery wiring kit allows easy on/off control from driver's seat. Adjustable flow gate controls amount of material being spread. Includes all hardware for installation and use. 56L polymer hopper mounts to the back of your ATV. All-steel frame features a quick detach for easy installation, and is powder coated to resist corrosion. Includes all harware for installation and use. Ideal for farming, hunting, landscaping or grounds maintenance. 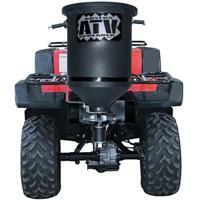 Multi-Purpose design lets you broadcast seed, fertilizer or game feed. Easy mount/dismount, quick-detach mounting bracket.